LONDON, UK — Today, Ubisoft® announced that Operation Para Bellum is now available on Playstation®4 computer entertainment system, Xbox One and Windows PC. Operation Para Bellum is one of the largest content updates ever released for Tom Clancy’s Rainbow Six® Siege. Introducing two new defending operators, Alibi and Maestro, alongside an all new map, Villa, set in the Italian countryside. Year Three Season Two also brings a slew of significant game updates, including new intel gadgets, operator speed adjustments, bulletproof cameras, and the all new Pick & Ban system. A feature that evolves the way players engage with multiplayer. Players will be able to unlock the new content starting today using Renown or R6 Credits. The land belongs to the Vinciguerra, a dangerous crime family known for their smuggling activities. The house is their retreat, where they lead a lavish lifestyle and collect rare art pieces. Players will catch Villa in a snapshot in time: Vinciguerras are burning documents and transporting their holdings before the big raid. But they’ve got wind of Operation Para Bellum and flee, leaving everything in disarray with vital information ready for the taking. In Operation Para Bellum, two Italian G.I.S. 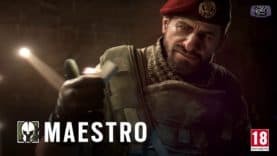 Operators join Rainbow as the unit raids a luxurious Tuscan villa, Rainbow Six Siege’s 20th map. WH 40,000 Sanctus Reach new DLC is now available: Daemons spawning from the Warp!